The news offset the latest round of weak U.S. economic data, which pointed to sluggish growth domestically. Officials of the Group of 20 leading industrialized nations told Reuters that central banks of major economies would take steps to stabilize markets and prevent a credit squeeze, if necessary. That spurred sharp gains late in Thursday’s session, erasing the S&P’s decline for the week. The benchmark index is now up 0.9 percent on the week, even as uncertainties persist over the euro zone. But some market participants were skeptical. “Ahead of Sunday’s election in Greece, central bankers stand ready, again. With all the water central banks have expended out of their fire hoses over the past few years in their attempt to ‘do something,’ I can only think of magic candles. Those candles you blow out that only flare up again immediately after,” said Peter Boockvar, equity strategist Miller Tabak + Co in New York. The Dow Jones industrial average .DJI was up 70.34 points, or 0.56 percent, at 12,722.25. The Standard & Poor’s 500 Index .SPX was up 8.54 points, or 0.64 percent, at 1,337.64. The Nasdaq Composite Index .IXIC was up 22.04 points, or 0.78 percent, at 2,858.37. Material .GSPM and energy .GSPE shares were among the biggest gainers of the day, with the two closely tied to economic growth prospects. Cabot Oil & Gas (COG.N) rose 1.5 percent to $35.55 and Alcoa Inc (AA.N) was up 1.2 percent at $8.75. But the market’s fear gauge remained elevated. 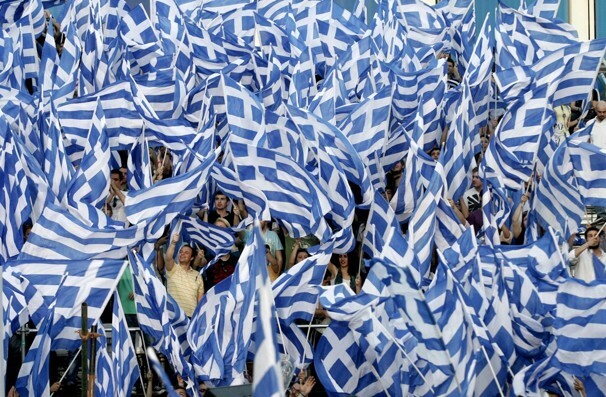 Investors fear the Sunday elections in Greece may set the nation on a path to an exit from the euro zone. That possibility, along with questions about the effectiveness of a bank bailout plan in Spain, has spurred volatility in a thinly traded week. The CBOE Volatility Index VIX .VIX was trading near 21 in midday trade, after rising above 23. Recent economic indicators, including Thursday’s unexpected rise in jobless claims, have pointed to sluggish growth in the U.S. economy. However, U.S. equities have largely tracked European developments in recent months, and shrugged off weak domestic data on occasion. The Wall Street Journal reported late Thursday Microsoft Corp (MSFT.O) would buy business software company Yammer Inc for $1.2 billion, citing a person familiar with the matter. Microsoft rose 2 percent to $29.92. Diamond Foods Inc (DMND.O) late Thursday said it had received a letter from Nasdaq saying it had missed the deadline for filing its already-delayed quarterly report, a fact which could lead to the company’s delisting from the stock exchange. The stock dropped 1.2 percent to $18.41.